There are two types of personality traits that are the roots for the most egregious and common communication blunders in the work place: excessive aggressiveness and passivity. Having an aggressive communication style does not necessarily imply belligerence or hostility, but can also refer to people with a forceful and controlling conversational technique. Aggressive communicators frequently barge into conversations without much regard for other participators and show little courtesy to the preferences and requirements of the listeners. On the other hand, excessive passivity can lead to a reputation of being wishy-washy, insecure, and prone to be victimized. Exhibiting passive conversational tones can also lead to being labeled a pushover and may encourage potential manipulators and bullies. 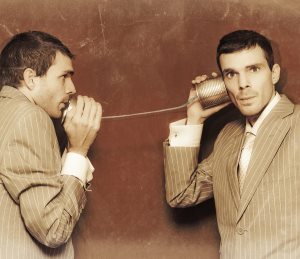 Though each of the above definitions are the polar opposites of one another, they are both examples of approaches to workplace communications that are completely wrong. In the office world, coming off as too aggressive can lead to constant office tension and strained professional relationships where too much passivity can stymie career development by making professional respect hard to come by. • First, take the time to make a concerted effort to get to know the people you work with and make friends. The more friendly your work environment, the more productive and easier it becomes to communicate your ideas, criticisms, and general feelings. And having people to have your back when things get ugly is always helpful. • Especially for aggressive types, it is important to look for the positive traits present in everyone around you instead of focusing on faults. And even noted faults can become beneficial give the proper circumstances and perspectives. • Difficulties communicating are not a permanent curse given the proper approach. If you are having a hard time with someone, politely confront the person and try to find commonalities that you can both agree to work toward. Cooperation is almost always beneficial and will help tear down the defensive walls built up around your differences. • Being seen as a perpetual victim can be as harmful to your reputation as being too pushy. There are bound to be many points during your career when you have to stand up for yourself and refuse to let others control your actions. When being positive and looking for common goals doesn’t cut it, it is time to stand up and protect yourself from the manipulations of others. • Regardless of your relationship with your workplace compatriots, keep the lines of communication open at all times. By maintaining an open-door policy with your coworkers and boss you can help to ensure no lingering resentment or overlooked abuses. Being a successful communicator is a delicate balance of give and take, but with enough effort and development time you will earn a big payoff not only for your career but for your professional reputation, workplace friendships, and overall job satisfaction.